Thermometer Sales Goal Tracking Boards. Measure your progress with our custom printed progress tracking boards. Now you can customize a board to track goals of any kind. Available in an economical non-magnetic or magnetic receptive magnetic format. The non-magnetic boards have the same great dry erase writing surface but a different substrate or backing which is not magnetic receptive. Non-magnetic boards can however be used outdoors because our boards are made with an indoor/outdoor vinyl and the PVC backing is 99.9% water resistant. If you're planning on using magnetics accessories then you will want to go with our magnetic receptive dry erase board These magnetic units should only be used indoors. Of course this image is just an example of what we can do. We will customize your board to fit your project perfectly. 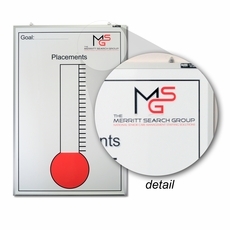 Track sales, profits, production or any type of goal on this custom printed magnetic receptive dry erase board with a thermometer permanently printed on it. Track any type of goal easily and quickly. All of our printed meter or thermometer boards can be custom printed with your goal in mind. Available in a Magnetic or Non-Magnetic format. Magnetic receptive means that you can use magnetic accessories and magnets with your board. Non-magnetic units can be used outdoors. Each board comes with full-length marker tray. One-time art work set up fee per file and your artwork is kept on file for a full year. Lead time is about 2-3 weeks after artwork approval. 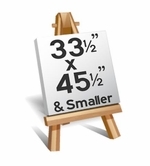 There is a one-time $25.00 set up fee for each different design on boards 32" x 45.5" or smaller. 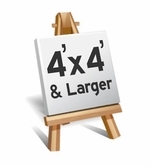 There is a one-time $50.00 set up fee for each different design on boards 4' x 4' or larger.